In The Human Province, a volume of fragmentary reflections, Elias Canetti writes that “one needs friends mainly in order to become more impudent, that is, more oneself.” With our intimates, Canetti believed, we are free to boast and lie and exaggerate, though we will come into our own only if we are moved to be indiscreet, to hold nothing back, to show the several faces we are inclined, as the spirit moves us, to put on. In this hefty volume of letters exchanged by Canetti, his wife Veza and his brother Georg between 1933 and 1948, we see at once how three remarkable people became “more” themselves by revealing to one another pretty much everything they thought and felt. 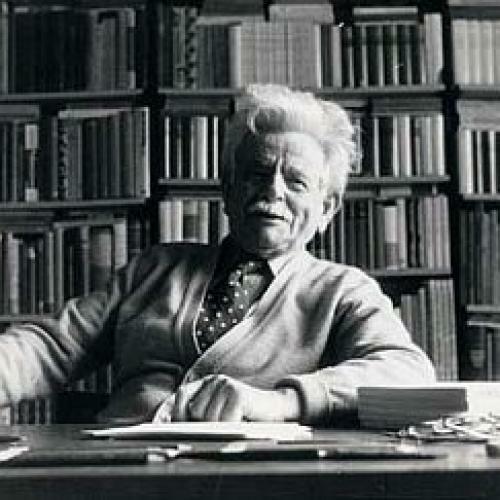 Although Canetti was always a writer of huge ambition, and did not hesitate to speak of his own “inhumane” and “abhorrent” self-esteem, he displays in these letters a sense of proportion rarely present in his major works. “Only doctors live in ‘reality’ all the time,” he writes to his doctor-brother Georg. “They live continuously within death, that is, within the essential surrender of our humanity. Of necessity, they are constantly failing, which deprives them of grandiose words (one cannot imagine a good doctor becoming a dictator).” Alert to his power over others, unwilling to curb his appetites or to apologize for a temperament notoriously passionate and commanding, he was never complacent about the potential damage that he did to those who remained in thrall to him, or who simply would not give him up. If he was a monster, he was exquisitely aware of his own excesses and cruelties. In truth we do not hear enough of Elias’s voice in this volume of letters. It is dominated by Veza, who was strangely devoted to her husband over the many years of a marriage in which he was involved, often very publicly, with several other women. She was a gifted and interesting woman who dreamed, incessantly, of what life would have been like had she been loved, and who dealt with her disappointment by making herself into a devoted, mothering, sometimes flirtatious figure to both of the Canetti men in her life, one of them a sometimes solicitous if distant husband, the other a brother-in-law primarily inclined to dalliances with pretty young men. Though Elias was loyal to Veza in his fashion, their marriage was from the first unconventional, and she was often at pains to clean up after him and to help him in his relations with women who were themselves notoriously volatile and unstable. Now and again, in reading the letters, we wish that Elias was better represented, that the harsh slap administered by his aphoristic prose—rarely on offer in the letters—was there to astonish and chasten us. Nothing in Veza’s letters can compare with the intellectual heft of her husband’s writing. But Veza could be, and often was, a vital and sympathetic correspondent. Her reflections on the course of World War II are brilliantly evocative. (“One day [in London] we had a bomb near the church, it was clear, that we were the target. The next hit the hospital, because it had a red cross flag pleading commiseration! Commiseration from German pilots!”) By turns hectoring and rapturous, melancholy and bitter, Veza’s account of Elias’s affairs often differs considerably from his. Georg, who contributes very few letters to this collection, was always uncertain about which of them to believe. Though Veza wrote compulsively to Georg and was for many years hopelessly in love with the idea of him, her moods and her instabilities so entirely color her letters that they hardly seem reliable. Even when she writes of the early Nazi years in Austria—“we’re not allowed to sit in the streetcar if an Aryan is standing”—much that she writes is coded so as to avoid deletions by the censors, who routinely intercepted and sometimes blocked the transmission of her letters. Occasionally she includes in letters of this period details obviously intended to divert suspicion from herself and her husband: “the German soldiers are nice: if they see a crowd taunting an old Jew who has to wash the street, they break up the crowd.” Between her own tendency to exaggerate and the conditions of life that made everything she wrote a complicated negotiation with the truth, Veza was a correspondent whose letters could be challenging, though they are always eminently readable and attractively human. Though often the letters deal with small things—intended trips, household finances, amours and breakups, book reviews and jealousies—they have about them, as a whole, an extraordinary intensity. Together they weave a spider web of uncommon intimacy and suggest that, for the Canettis, letter-writing was a great deal more than an exercise in ingenuity or a means of staying in touch. The somewhat neurotic need for reassurance, or for affection, or merely for monetary assistance, will here and there seem tedious and predictable, but the letters will more often seem bracing and even inspiring. For the Canettis were, all three of them, real intellectuals. They were all perpetually absorbed with ideas, recommending and ranking books, disputing one another’s versions of reality, arguing about what should and should not matter. Though Veza could be petty and self-indulgent, and Georg could be solemn about his brother’s “trifling” love affairs and generally “disgusting behavior,” and Elias could be fatally earnest when it came to defending his good intentions, their letters finally turn out to embody what Elizabeth Hardwick once called “a benevolent form.” They allow their authors “a means of expressing the ideal self,” a self conflicted, imperfect, reckless, but all the same steadfast in the pursuit of what is genuine and true. The Canetti letters are never perfunctory or indifferent, never coy or evasive. They are the letters of essentially serious though incurably eccentric human beings knee-deep in the muck of life. “I live in one fear,” Elias had once written, “that my thoughts may be right too early, and that is another reason why I give them time to unmask their entire falsehood or at least slough off their skins.” This tense alertness to falsehood, this reluctance to be “right too early,” was in varying degrees a common attribute of the Canettis. In the letters they play out large emotions and try out inchoate ideas the better to discover what can survive the perpetual probing and unmasking to which they are committed. Though Veza was a minor writer, and Georg a tubercular medical doctor who wrote several important books while moving in and out of sanatoriums throughout his adult life, both were as given as Elias, the great writer, to the relentless anatomizing of their experience. “Esprit is the only thing for which I long,” Veza writes in one of her letters. It is a longing shared more or less equally by these fascinating and insatiable people. Robert Boyers is the editor of Salmagundi and Director of The New York State Summer Writers Institute. His most recent books are Excitable Women, Damaged Men and The Dictator’s Dictation: Essays on the Politics of Novels and Novelists.